*We can file this under: “Are you sure you’re just a kid?” Or maybe, “Society has got this wisdom thing all wrong,” but most likely, as our black elders used to say, “You’ve been here before so why you front’n?” because two young boys still in elementary school have already accomplished, in the early stages of their lives, what many of us are still trying to do. 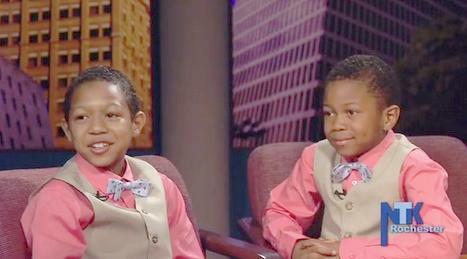 Meet brothers Jeremiah and Joshua West, now 10 & 7 years old respectively, who, thanks to parents who demonstrated what can happen if you listen to and believe in your children, nurtured their young hearts’ desire to display compassion, are now published authors and philanthropists. The West brothers put their desires in motion by being “Change Agents,” those who inspire children all around the world (as far away as Malaysia) to give back to the less fortunate in their community.